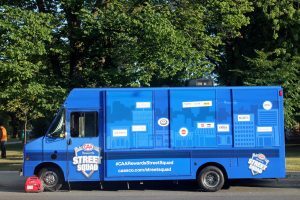 When I joined the Jam Van team I wasn’t exactly sure how I would fit in and what I would have to offer to an Experiential Marketing company given I came from a technical background. I quickly realized that having an eye for detail and a creative imagination was all I needed to find my niche and make my mark on the production side of the business. Creating a space station at the corner of Yonge and Bloor Streets in the heart of downtown Toronto was where it all started. 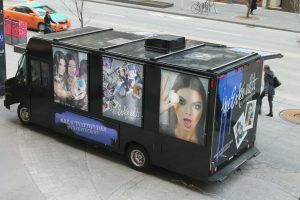 Although opportunities like that don’t happen every day, Jam Van vehicle wraps are something that happens more often. 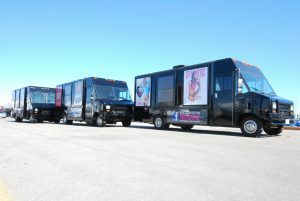 Besides having six interchangeable billboards and two video screens, the Jam Van offers our clients the opportunity to use our vehicles as their canvas to create a beautiful eye-catching advertising space that will be seen by many people. 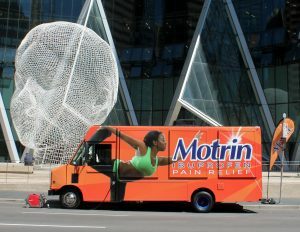 It transforms the van from a mobile billboard with ad space to a marketing experience with a touch of class! To make everything work I provide clients with a mock-up which allows me to show them the potential of what they can do with their campaigns. Sometimes we call in the big guns to give us an artist’s rendering of a full campaign. This is both fun and nerve racking especially when I have no idea what a client wants to do. 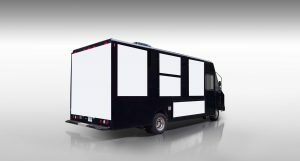 Before I go to the final design I give our clients a scaled Design Template of the Jam Van so they have a clean canvas to work with. Create layered artwork so you can easily change components and pictures to your liking. Sometimes your first choice is your least favourite. Use bold colors and one main point of focus might work best to make your design eye-catching. 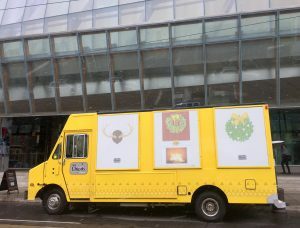 When the Jam Van is parked or in motion the first thing that catches peoples eye is colour and when it pops alongside good high-resolution graphics we have already captured the eyes of passersby. Always try to keep it simple. Overly complex designs will often defeat your purpose, both in being visually confusing and difficult to install. Too much information on a wrap will work against a good impression. Once all the artwork is complete, I review it and look for details that might need to be adjusted and make any suggestions. Often our clients miss things like door hinges, frames, curves, etc. Also, I work with the printers to make adjustments, double-check measurements between your digital template and the actual vehicle to avoid any costly mistakes. Designing “flat” artwork to fit over an irregular three dimensional object can be tricky, so I work closely with your printer and installer to achieve the best possible outcome. 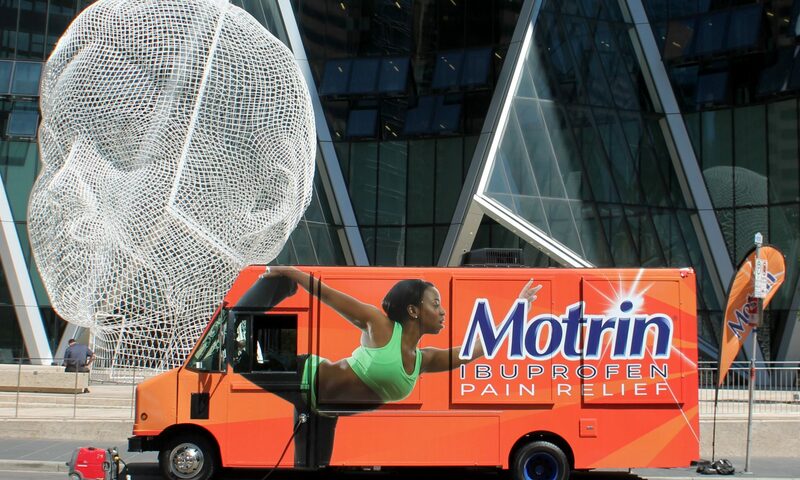 And that in a nutshell is how we create a successful vehicle wrap! I had just come off a great family vacation in Jamaica, where I relaxed in the sun and got to see my son play in the surf and sand and fly on a “big uppa” (his word for airplane) for the first time – he’s 2. After only a couple days back in the office, I had to push reset and fly again, this time to New York for Mirren Live, The 2017 New Business Conference. My boy sat this one out and opted to go to his day job as Chief Colouring Officer at Day Care. This trip was the opposite of a vacation. My mind was not dealing with simple decisions, which seemed challenging at the time, like choosing between a Red Stripe or Red Stripe Light at the swim up bar. Instead, from the moment I entered the conference I was greeted by more stanchions than I experienced catching a plane from Pearson to LaGuardia. Here, I to had to listen carefully for where to go next. It felt like sheepdogs were barking instructions on how to get to my feeding post. I could have opted out of the round up and instead dive into the ¼ inch thick glossy, ring-bound conference manual with small type font and a legend on every page, but I knew inevitably I would have put myself in the neck-breaking front-row of the 400-person theatre; not a relaxing way to kickback. Also in contrast to my vacation where I didn’t have to carry or wear anything but the RFID wristband, I had to write everything down and determine at an accelerated rate if what I was writing was necessary, how I would later decipher this information, and how it related to the notes I made to myself in the top hand corner of the page. This was work that would require more work, if anything I wrote and learned about was going to work in practice. And I loved every minute of it! 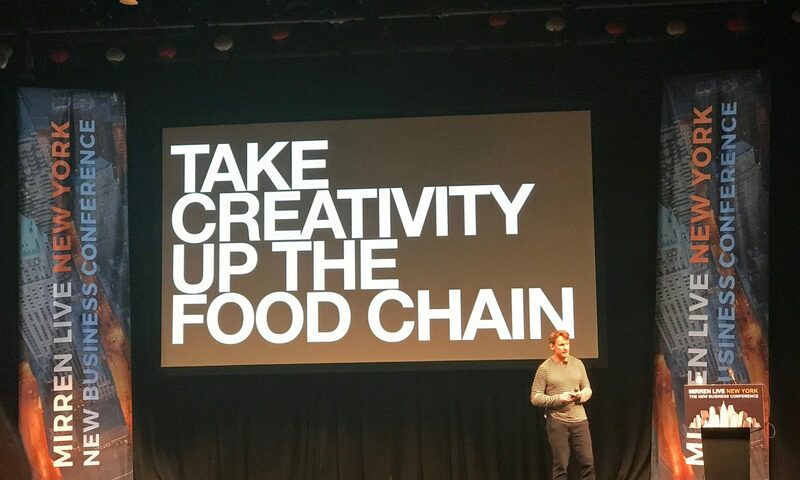 I’ve been to a few conferences during my time at Jam Van – some local and small in scope, some large and international – but I took a great deal more from this conference than any other. Many of the sessions I joined were not just relatable, but provided clear, concise, and most importantly, actionable ways to duplicate the success of the speakers. One of my favorite session speakers was Brent Hodgins, Mirren’s own Managing Director, who I later found out is a fellow Canadian. They are a business consulting agency, who get paid to come into organizations to provide guidance on uncovering their business ethos and solutions for building new and organic business. Fortunately, Brent was able to convey the value a conference producer and consultant could bring to potential attending clients, by sharing very relevant and practical material and forthcoming responses to tough questions, which is not often the case at these types of events. In all honesty, he set the stage and a very high bar for the other speakers to follow. Some of the other speakers didn’t connect as well as he did with the audience and some were still perpetuating dated clichés and redirecting and “key messaging” when challenged with direct questions. This is much more typical, I find, of conference and motivational speakers. I found Brent provided some “sans PC” answers to questions, sometimes before being asked about issues that plague agencies and business development people. Most of us, learn through trial and error which too often leads to few consequential wins, especially when you compare to how often you’re told “you came second” with not as much as a ribbon to show for your efforts, not to mention any real insight on how to better your efforts next time. He gave welcomed insights on who we as an organization – without knowing anything about Jam Van or myself – should be targeting for new business opportunities, how to categorize that list of targets and utilize research to create compelling content to connect with target and adjacent (indirectly related) prospects. It was like listening to how a chef focuses on creating a main dish, and makes other great dishes from the “waste”, usually yielding greater margins. Aside from Brent, he and his team at Mirren brought in other straight shooting speakers, whose humility captured the audience’s attention and built trust – speakers like Bob Kantor from MDC Partners, Zach Rosenberg of MBMG and Laura Maness, CEO of Havas New York, who shared simple, grounded and effective ways to proactively reach out and secure business – without going through a competitive review. Other notable presenters like Havas Chicago, Chief Client Officer, Tatia Torrey provided insights to turning project based clients into long-term retainers, a welcome topic that helped unravel the mystery of how to make a client want more or as she put it, “turn a first date into a marriage”. Lastly, some provocative and interesting quotes came from conference speakers that I hope serve me well to remember and advocate, such as, “a lot happens between PowerPoint and implementation.” Although this was reserved for a conversation between management consultants and agencies – a hot button at the conference – the idea resonated for me, when you consider what experiential marketers do to make activations a success for client(s), brands and targeted consumers. A very popular session to Mirren Live, which turned out to be a great way to end the first day of the two-day conference (besides the open bar), was the Live Pitch Competition. This was as exciting as it was inspiring and informative. I saw how coming in second is only good for you and your team to know, if you’re told what cost you first place and what set you apart from the competition – aside from budget! As important, the Live Pitch Competition revealed the client’s perspective and the finite amount of time you have to communicate your credentials and show-off your response to the RFP, before you lose their attention. I genuinely felt for clients, having to listen to multiple presentations. Following the first mentally exciting and exhausting day of the conference and later a wonderful night of good company, exquisite food and drink that you can only find in the epicurean epicenter of the world, I was praying the second day would be as invigorating as the first and the morning Keynote at 8:30 a.m. would be worth rolling out of bed early, knowing the session was titled Growth Strategy: Inspired by Personal & Social Values. I didn’t think it would be a stretch to think this was not going to be too jarring, or loud but perhaps a little preachy – perhaps time I would use to think about how to install more solar panels on the roof of our Jam Vans. Boy was I wrong! The speaker, Scott Harrison, was magnetic. He woke and sobered everyone in the room and even received a standing ovation following his presentation. He even put Brent, the Managing Director of Mirren and event host to tears. Moreover, like a joystick, he moved everyone to the right, left, in-behind and in-front of me. Talk about passion, humility and marketing prowess – I stumbled out of the conference room, where I was supposed to remain for the next session, whispering to an attendee “I didn’t come for this. He killed my high, but somehow empowered me!” If you ever have a chance to experience this man’s presentation, you will never feel the need to be braggadocios to be heard again. It was too humbling an experience to explain, however a very simple message and solution to grasp. The following snippet only captures a fraction of the emotion felt in his live presentation. If ever there were an example of 360 marketing, this was it. I’m a convert and will commit to support the commodity, Charity: Water, as long as the “good” is available! Although the experience was a 180 of a sun-filled vacation, I came back to work invigorated and looking forward to reviewing the live broadcasted sessions and watching others I was unable to sit in on with my team. After this past month, I believe more strongly in the adage of taking a vacation to re-charge the batteries, even for a workaholic like myself. I love working. Creating and making a difference for all those I work with and for gives me great pleasure. I would however, like to add to this adage and say before quickly running back into battle (to begin the process re-depleting the batteries) it’s a good idea to make time to re-align your goals and strategy before suiting back up. Find something or someone to help you rearm, to continue the good fight and hopefully you’ll find a more rewarding and efficient way to do battle. I think even a workaholic can appreciate this strategy. 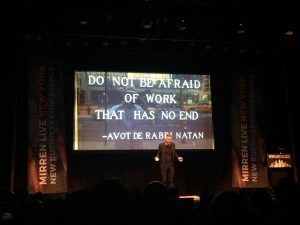 So, for next year I plan to do this again, take a vacation to rest the mind and soul then follow up with an invigorating conference like Mirren Live. This one will stay with me for some time. Here’s to Jamaica X Mirren Live, 2018!